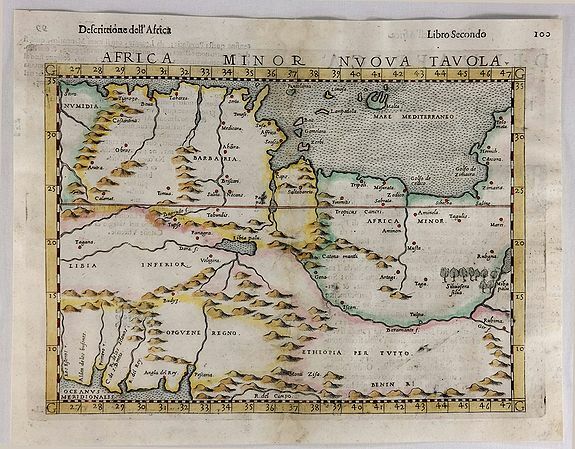 Old map by RUSCELLI -Africa Minor Nuova Tavola. Title: Africa Minor Nuova Tavola. 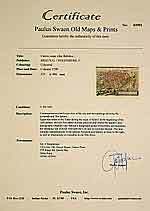 Size: 7.9 x 9.8 inches. Condition: In fine condition with light age toning. Striking impression of Ruscelli's map of the region of present day Algiers, Tunisia and Libya. Ruscelli sought the most up-to-date geographical information available, making the modern maps in “Ruscelli's Geographia” among the best modern maps of the period. The map first appeared in the 1561 edition of Ruscelli's edition of “Ptolemy's Geografia”. Italian on verso. Girolamo Ruscelli, (1504-1566) was an Italian Alchemist, physician and cartographer. He revised the Ptolemy Geography, which was issued from 1561 until 1599 in Venice.